Is this a record? It’s only Day Six of this project and I have already watched the worst “Christmas” movie on my list. It’s so bad that I actually may need to add another rule so that I don’t have to watch anything like this again. 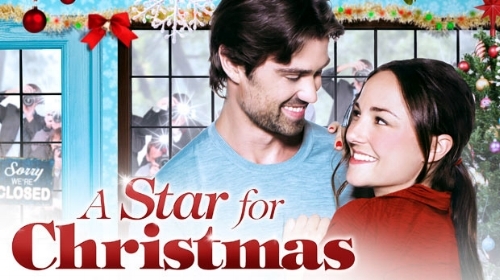 A Star For Christmas is another 2012 movie made by Mar Vista Entertainment. (Actually, I’m not sure if it’s Mar Vista or Marvista or MarVista as I have seen it written all three ways.) Love For Christmas was the first of their movies that I watched. As you will recall, also terrible. I think I may need to ban Mar Vista movies from the project, lest I go insane before Christmas Day. I’m going to give you a little synopsis but, keep in mind, it doesn’t make any goddamn sense. Cassie (Briana Evigan) is a baker in a small town. Because her cupcakes are SO AMAZING, she gets hired as the exclusive craft services treat supplier? The star of the movie, Alex Gray (Corey Sevier), stops by Cassie’s cupcake shop and falls in love with her? They start dating but Alex’s ex-girlfriend, Skylar Saint Jean (Brooke Burns), tries to break them up? Then, um, love? I wish I was lying when I said this movie didn’t make any sense. Cassie is a TERRIBLE businesswoman. In the first ten minutes of the movie, she literally sells a dozen cupcakes for $6.95 then throws in an extra Santa cupcake because she knew the customer would want it. I want to know where she lives that she can afford to sell her cupcakes for that cheap and still make money. Later in the movie, she claims that she makes all of her money for the year at Christmastime. Girl, you have an actual store with rent and electricity and all that. Don’t ask me to believe that you sell so many cupcakes in December that it can pay for the store plus pay Tricia (Karissa Vacker), your best friend/employee, for an entire YEAR. Also, your store is called Cassie’s Cupcakery. Who let you do that? Then there is this movie thing. Cassie doesn’t own a television, therefore she knows nothing about the outside world! She has never heard of this super famous actor, who is apparently all over the tabloids. Apparently, she doesn’t read newspapers either. But she does use the internet! Once they start dating, she is all over the paparazzi sites reading dirt on him and getting jealous over it. Even if I suspend some disbelief, allowing her to not know who Alex is, she goes batshit crazy throughout the movie. She’ll be making out with them, then suddenly ask him why he’s doing things for her (BECAUSE YOU MAKE OUT WITH HIM), then she’s running away because he can’t possibly like her, then she sleeping with him. It feels like they filmed all of these scenes then put them together out of order. Like the script was written so she didn’t act like a lunatic but the editor or director messed up the order of the scenes so she looks insane. Two more things that I hate about this movie: 1. Craft Service Dessert Tables aren’t a thing. Especially not on an ‘action Christmas movie.’ Craft services is a table with snacks (like vegetable trays or muffin trays or something) where the cast/crew can grab a quick bite in between scenes. Cupcakes don’t really fall into that category. 2. There is a running joke that the friends (Cassie, Tricia, and Cassie’s brother Zack) don’t know how to pronounce Skylar’s last name. Is it John? Is it French like Ghawn? But no one ASKS her. And I think they actually pronounce her name different ways TO HER FACE. Then, at the end of the movie, there is a voiceover promo for the in-movie-movie and the announcer says her name is Gee-Ann. Get out of here. I wanted to like this movie. It had a baker (though I was hoping she was Melissa Joan Hart…she’s another one of my Christmas bucket list actors) and…well, it was really just the baker part that made me want to like it. Instead, it almost made me throw my remote at the screen. So, I’m officially changing the rules now. No more Mar Vista (or Marvista or MarVista) movies. Especially if they are from 2012. That was a terrible year for them. I may need to do a little more research before I watch a movie but I think it will save my sanity in the end.